This day belongs to toestor. "It's my wife's (Holly) birthday!" Glorious day in december in a red hot number donated by Eliza, vintage suede hat from a Brooklyn antique warehouse, tights donated by Cat and vintage boots from eBay. It's sunny in MA too! So striking - all the red. 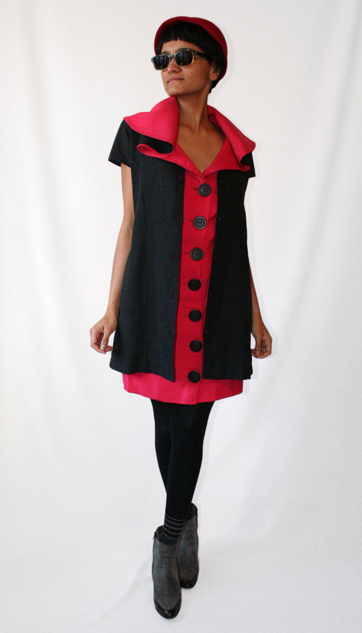 The large black buttons are a wonderful complement! Sharp outfit! I love it! It looks like it is all one dress. Excellent. typical northern California weather. But not typical outfit. This one is totally wonderful! I could never wear this, just wouldn't hang right on me. But you look great! Enjoy the warm day. This looks great! The "red hot number" completely transforms the dress! Mariah tagged this Hot as a SunSpot! Another total transformation of the Uniform! Has a vintage 40s look (in a GOOD way). Creative! Lovin it - that is one fantastice colour. !!! OMG!! I can't believe my eyes to night..such a fiery outfit for the glorious day in N.Y, when we are freezing in this part of the globe...Well, you deserve it as this month is "Holiday Mission" December..Eliza's red hot number is smashing..
Could you be any cuter!? Those buttons rule. Sheena, you're looking great! I found that red dress at the Salvation Army, one of my favorite finds ever. Golly, I love New York thrift stores. This is one of my favorite outfits of the 217 days!!! PLEASE ask Eliza to make that red dress available for us to buy!!! GORGEOUS!! I just read Eliza's post & I'm so disappointed that it's not one of her creations, so it won't be available.... Oh well! Strange...but I can see your vision. Although, I liked the boots better with one of your prior outfits-not so much, here. Those boots...I'd kill for them! Eliza, the dress is from Salvos?! Wowwww! That's an amazing find! I was thinking it must've coast the earth - looks it! You look great Sheena, I can see how the hat works, but doesn't work for me! I love it! Great job! Your shades told me that you've been playin hooky. Take me with! well dressed and put together! I love that dress! LOVE the black dress over red dress!!! what will happen to all the donated pieces after this project is over? Sarah tagged this Striking and lovely! Love this outfit! Looks like it flows together really well! Just keeps getting better- Thank you for my daily inspiration! This is probably THE best oufit ever. I absolutely love it! It reminds me of Audrey Hepburn. just perfect! i luv the project! Chic with a touch of old fashioned glamour in the overall shape. I would wear this. Nice outfit! It`s cool how many looks ypu can get by 1 dress!